It’s the age old question, “If you were castaway on a remote desert island and allowed to bring only one beer to enjoy in blissful solitude, what beer would and should you bring?” Well, thanks to Sam and a team of our co-workers, we’ve got your answer! Meet It’s The End of the Wort As We Know It - an exclusive made from a complex mix of nutrient-packed super foods resulting in the ultimate and definitive survival beer. Deep purple and hazy in color, It’s The End of the Wort As We Know It is a Belgian-style fruit ale chock full of essential amino acids, micronutrients and vitamins. To concoct this off-centered brew, Sam and the crew blended an intensely fruity mixture of blueberries, acai and goji berries, along with an assortment of ingredients that includes purple sweet potatoes, rose hips, chia seeds, flax seed, spelt, oats and quinoa. While It’s The End of the Wort As We Know It is nutrient-rich, Sam is sure to clarify, “We’re not making any health claims in association with this beer. We are merely sharing our brewing process and the culinary ingredients we chose for the recipe that are rich in alluring aromas and flavors.” Slightly tart and subtly sweet with jammy blueberry, cranberry and cherry flavors, this medium-bodied beer clocks in at 9% ABV and is a critical addition to your survival bunker … at least we think so, anyway! This 'first of its kind' beer will be released on January 27 at 11 a.m. as an ultra-limited (and super special) bottle release at our Milton brewery. 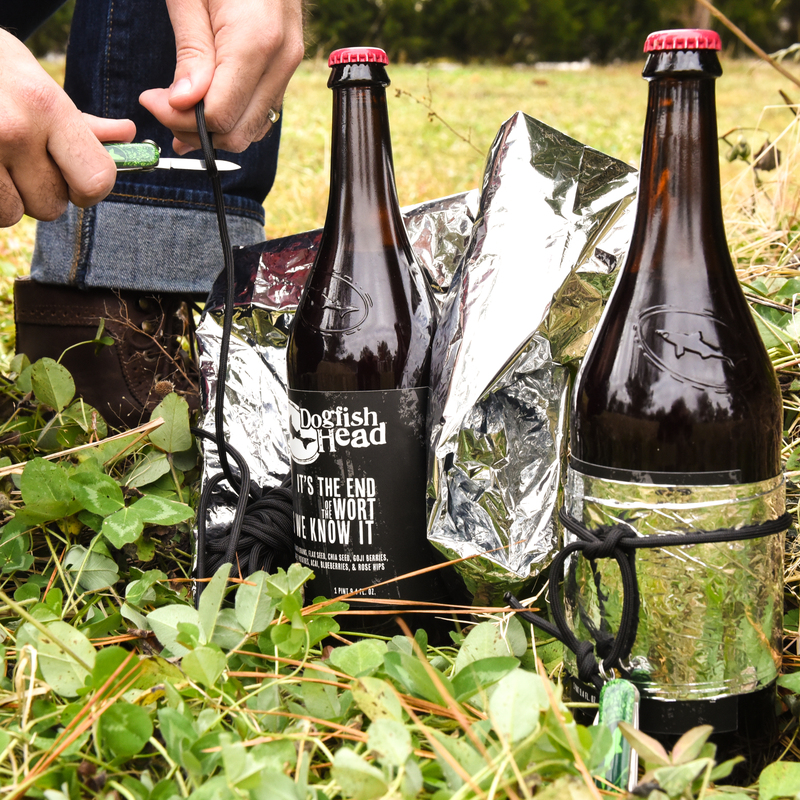 A true survivalist kit, It’s The End of the Wort As We Know It is hand-packaged in a 750ml bottle and includes all the necessities to ‘potentially’ outlast the apocalypse (beer included, obviously). You’ll find a limited-edition Dogfish branded Swiss army knife tied to the neck of the bottle which will aid in opening your beer bottle or whittling a fishing spear to capture a conch for dinner. The bottle itself comes snuggly wrapped in a big ‘ol solar blanket you can use to protect your beer ... er, body from changes in the weather. And lastly, you’ll find a length of paracord securing the blanket to the bottle which just might come in handy if you need to make a tourniquet, or if you accidently drop your survival beer in quicksand and need to quickly jump in to heroically retrieve it. Safety first, beer recovering second (or maybe it’s the other way around). Priced at $45, only 200 packages of the once in a lifetime It’s The End of the Wort As We Know It kits will be available for purchase, so be sure to get yours*! It will also be on tap at our Milton brewery while supplies last ... only two sixtels, so hurry! *Only two packages per person, folks!